WOOT WOOT! Cue the happy dance music! Today, November 26, 2013, I reached my NaNoWriMo goal of writing 50,000 words! I know that it’s not all gold, but it’s written down. This in itself is a happy dance moment for me. Can’t wait to go back and sift through it all. Add the meat, and get rid of the awfulness! A HUGE thank you to everyone who has encouraged and pushed me to get it done. I’m still going to write until the end of the month . . . so we shall see what my grand total is! Will keep you posted. Today is the 15th of November. I have officially reached the HALFWAY POINT for NaNo, and I’m STILL ALIVE! 🙂 Thankfully the ideas are still coming strong–almost too strong on some days. My goals have been to write at least 1,667 words a day, and to NOT edit. Some days I have written a lot more than 1,667. Some days I wrote a lot less. But I have NOT edited, even though my fingers are twitching. Having “writer with an editor brain” syndrome is hard to combat, but so far I’m resisting the urge. Day 3: Only wrote 891 words today, but I finished my “first week” of NaNo with 7,812 words. My handy-dandy calendar said I should be at least to 5001 words…felt overall accomplishment! Day 8: My boys didn’t have school today….And I decided to use Anna Kendrick as my model for my heroine, ENDICOTT. So, of course I had to “search” on pinterest…which led me to deciding to learn the Cup Song…which sent me to YOUTUBE….which made me want to learn the words that Anna Kendrick sings with it on the movie Pitch Perfect…Yeah, I get distracted easily. But I accomplished the cup song, movements AND words! I only got 658 words written . . .
Day 9: Today I went to one of my favorite places (Lamoka Lake Baptist Camp). I helped run the wood splitter, and chuck and stack wood. Great exercise! Came home and wrote 1,791 words. Day 10: Sunday, day of rest… but did manage to write 2,561 words. Day 12: NO SCHOOL: SNOW DAY!!! WHAT??? Back on coffee…sent out the signal… wrote 3,664 words (think I’ll keep drinking it). Painted my nails with silver glitter nail polish and wrote 50,000 WORDS in blue nail polish. 🙂 Now every time I look down, I see 50,000 words! Day 13: 948 words…hit 25K…halfway there for word count! Woot! Woot! Day 15: STILL WRITING (hmmmm, do these wonderful words on my blog count??) I’m trying to get as many words written this morning as possible because my brain will not be working tomorrow. Tonight at 6PM until 6AM tomorrow, I will be with over 1,000 teenagers and adults…teen all-nighter…a night of watching a hockey game, playing volleyball & soccer, pizza, bowling, and inflatables!! )….lots of FODDER just waiting for my pen to hear it! **I can’t write in order, going from “Once Upon a Time” to “The End” is not really my style. It just frustrates me to no end. My mind jumps all over the place. I get an idea for a scene, and I have to write it down before my brain will let me move on. But having Scrivener has been a life saver, catering to my mind-hopping tendencies. I’m able to have folders that help me stay organized and out of order! This is where I’m at. Type ya again at the end of November! For those of you brave writer’s in this boat with me, good luck! Yeah . . . in between making pilgrim and Indian costumes . . . in between baking cookies . . . in between coffee breaks . . . in between grocery shopping . . . In between loads of laundry and dusting . . . In between remembering they have children . 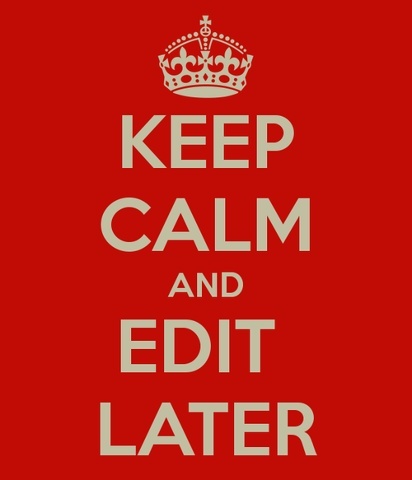 . .
My Goal for NaNoWriMo (well, besides the obvious one of reaching the 50,000 word mark) is to NOT EDIT! I am a writer with an editor brain. I can’t stand when I write a scene and I know it’s awful . . . I want to make it close to perfect before I move on. But this is not possible during NaNo . . . so, I’m subduing the inner editor with coffee, and chugging along! Wish me luck! **Okay, enough playing here . . . Back to WRITING!